How Are The Best Teams Built? How do certain groups work effectively together while others remain dysfunctional? Teamwork is a very complex necessity in business settings. We are taught to work in teams from a young age. If you had to do group projects as a child, you will well remember the bitter-sweet times you and your teammates had. As you get older working in a team becomes more difficult. This is because more is at stake when working on business projects. Money, careers and clients are on the line; therefore, it is absolutely essential that all team projects run out successfully. Let’s take ants for an example. They rely on each other for survival, just like you rely on each other to get a project to reach its full potential. Similar to an ant colony everyone on a team has a certain role to full. There are “worker ants”, “soldier ants”, fertile male “drone ants” and fertile female “queen ants”. Together the colony of ants is able to form superorganisms as they operate as a unified entity. If everyone in your team knows the purpose of the work they are doing, you can work more effectively together. Make sure you all have a clear understanding of what your responsibilities are and what expected outcomes need to emerge from your projects. As a team, you should be able to openly express your thoughts and opinions to your group members. This will enable teammates to communicate honestly and avoid any communication mishaps. Using sounds, touch and pheromones, even ant societies communicate with each other to solve complex problems as well as to protect each other. Every team member is important and therefore everyone’s ideas should be discussed rather than immediately discouraged or written off. No matter how “insignificant” someone’s idea may seem, every member of the team contributes to the teams overall success. Never remain stagnant. If all individuals in the team improve themselves then the team as a whole will improve. If possible, you should take a short course to improve your business skills. If every teammate feels a sense of belonging in the team, they will work hard to not disappoint the group. If a team member has a problem, you need to make sure they are supported by the team. 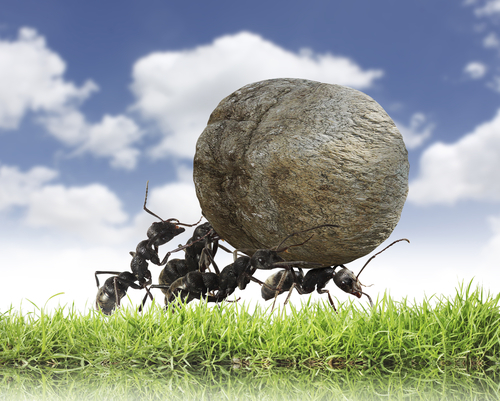 Like ants, every team member has strengths and abilities that your team needs; ants know their place in the colony- make sure your team members figure theirs out. When working in a team, you will definitely experience conflicts and disagreements. Make sure you resolve all disputes effectively to avoid clashes within the team. Getting to know your team outside the office can help you all work more effectively together. Consider corporate teambuilding to build trust and support between your team.